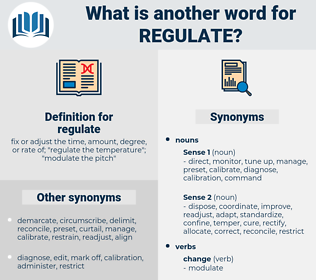 What is another word for regulate? fix or adjust the time, amount, degree, or rate of; " regulate the temperature"; " modulate the pitch"
be in the driver's seat. stages, Standards, norms, regulatory, rules. lay, manage, supervise, adjust, resolve, organise, address, monitor, monitoring, oversee, stipulate, Stipulated, stipulates, solve, restrain, normalize, legalize, rule, rules, steer, cover, throttle, stabilize, deal, scrutinise, define, fix, normalise, mediate, dictate, handle, adjudicate, legalise, fine-tune, tackle, constrain, impose, institutionalize. 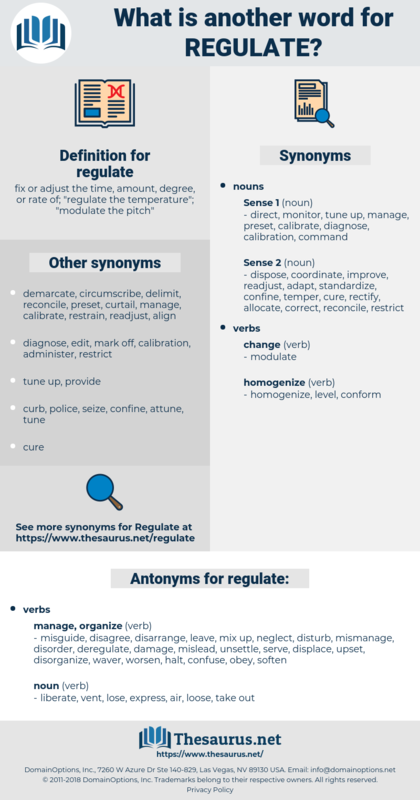 regularize, regularise, legislate, re-regulate, restrict, settle, formalize, administer, reorganize, readjust, regulation, prescribe, conciliate, rectify, govern, establish, discipline, determine, guide, accommodate, dominate. misguide, disagree, disarrange, leave, mix up, neglect, disturb, mismanage, disorder, deregulate, damage, mislead, unsettle, serve, displace, upset, disorganize, waver, worsen, halt, confuse, obey, soften. liberate, vent, lose, express, air, loose, take out. But he placed an intimate of his own in the high position of confidential councillor, the ambassador to regulate war and peace. 31. What should regulate the inflections? resolute, result, rock salt, regulated, rascality, rockslide.